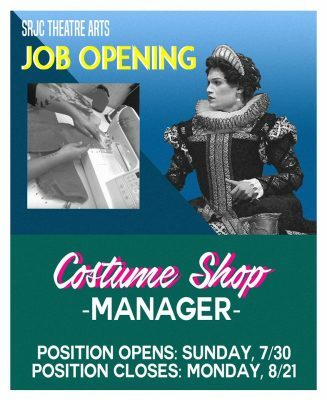 The Theatre Arts Department of Santa Rosa Junior College is seeking a qualified costume technician with demonstrated sewing and costume shop management skills to join an outstanding team of faculty, staff and administrators to provide high quality services to our district, our community, and most importantly to our students. Under general supervision, provides technical and artistic support for the construction and maintenance of theatrical costumes; performs related work as required. Appointments are contingent upon funding and Board approval. The Theater Arts Costume Technician constructs costumes for theater productions; supervises students in the construction and maintenance of theatrical costumes; ensures regular maintenance of equipment; and purchases necessary supplies and equipment.